The removal of material from solid surfaces by the technique of laser ablation has become increasingly important in a variety of applications such as advanced micromachining, surgery, x-ray laser generation, mass spectrometry of bio-molecules, art cleaning/restoration and fundamental physics studies. In fact laser ablation is now a well-established technique for the deposition of a wide range of materials in thin film form and many different materials have been grown using this technique most notably high temperature superconductors, diamond-like carbon (DLC), ferroelectrics and wide band-gap semiconductors. LPA allows deposition of multicomponent materials by employing a single target and can also be setup to load multiple targets on a rotating holder, which can be used to expose different targets to the laser beam, thereby enabling the in-situ growth of heterostructures. The fundamental processes occurring in the formation and evolution of these laser produced plasma plumes are still not completely understood and are the focus of intensive research. 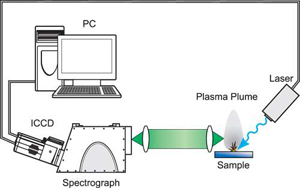 Diagnostic techniques, such as optical emission spectroscopy, laser induced fluorescence, absorption spectroscopy and fast imaging are being used in an attempt to characterise the plasma as it expands either into vacuum or ambient atmosphere. The basic idea of laser ablation is quite simple. A high power pulsed laser is focused onto the target material and, when the laser fluence exceeds the ablation threshold value for the material, chemical bonds are broken and the material is fractured into energetic fragments, typically a mixture of neutral atoms, molecules, and ions.Since the material leaves the reaction zone as an energetic plasma, gas and solid debris mixture, the ablation process resembles explosive evaporation of the material. A unique property of the ablation process is that most of the absorbed energy is deposited in the ejected material, so that there is little or no thermal damage to the surrounding target material. 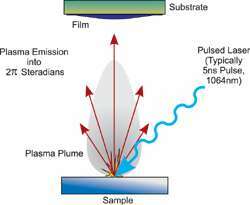 The plasma plume created thus then expands in vacuum or a reactive atmosphere, before condensing on a suitable substrate (in the case of material deposition). The properties of thin films produced in such a way then depend on the substrate temperature, laser fluence/power density, target to substrate distance, the nature and pressure of the reactive gas in the deposition chamber and, of course, the target material. At present the physical and chemical processes occurring within these transient plasmas are not well understood, so deposition conditions for each material are optimized empirically. If researchers can understand the fundamental processes which occur within these plasmas, it will not only be of purely scientific interest but also of commercial interest, as it could, for example, make the optimization of deposition conditions much more efficient. In order to achieve this, sophisticated diagnostic techniques are required.